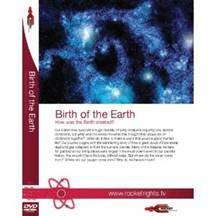 The Birth of the Earth - Space - How was the Earth created? Our planet now supports a huge diversity of living creatures requiring very special conditions, but what was the series of events that brought this unique set of conditions together? What did it take to make a world that would support human life? Our journey begins with the astonishing story of how a giant cloud of inter-stellar dust and gas collapsed to form the sun and planets. Many of the features we take for granted on our living planet were forged in the most violent event in our planet’s history. We wouldn’t have life today without water. But where did the water come from? Where did our oxygen come from? Why do we have a moon? When did the Earth get water? When did the Earth get oxygen in the atmosphere? How did the Earth evolve to support life. Our planet now supports a huge diversity of living creatures requiring very special conditions, but what was the series of events that brought this unique set of conditions together? What did it take to make a world that would support human life? We take an imaginary ‘human’ time traveller on a journey back to the moment of formation of our solar system. We meet the scientists who are carrying out their own detective work, uncovering the clues around the world today into what our planet was like 4 and a half billion years ago. Our journey begins with the astonishing story of how a giant cloud of inter-stellar dust and gas collapsed to form the sun and planets. We discover that the intense heat of the early Earth created a molten iron core. This generated a magnetic shield around our planet that protects us, to this day, from the sun’s deadliest particles. Many of the features we take for granted on our living planet were forged in the most violent event in our planet’s history. Early in its life, the Earth collided with another planet. Planetary Scientist Robin Canup has modelled the impact using supercomputers. She reveals that the resulting fireball was so energetic it melted the Earth and created the moon. This dramatic impact gave us our tides and seasons. We wouldn’t have life today without water. But where our water came from is a mystery that has long puzzled scientists. At a NASA research laboratory, Michael Zolensky studies a recently discovered meteorite that supports the view that water came from space. For the first half of its history the Earth had an atmosphere of methane and carbon dioxide we would find impossible to breathe. One clue as to how the earth acquired its oxygen can be found in Australia. Shark Bay in Western Australia is home to strange bacterial mounds called stomatolites. The bacteria in these objects are pumping out oxygen. A few hundred miles away geologist Martin Van Kranendonk shows us a fossil stromatolite – the world’s oldest fossil. The evidence suggests that these strange objects are responsible for creating the air we breathe.